I put together an example project using GWT (Java client) + Scala (server backend) + Maven. You can find the example on GitHub. The full exception is attached. Ordinary Scala apps are working fine. 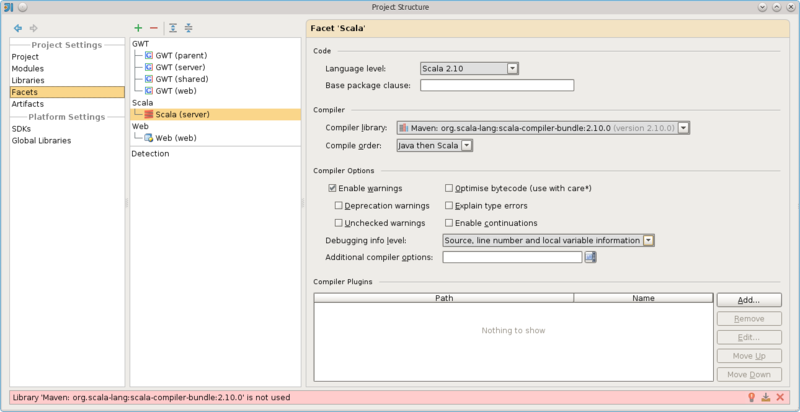 Also, I can compile and run this project without problems if I use Java instead of the Scala code in server module. So problem seems to be related to GWT plus Scala usage. Please try to disable "external build" in IDEA as workaround for your problem, probably, it can help. Ok, that worked, but as far as I understood this is the legacy mode for compiling, isn't it? So will this be fixed? Should I open a ticket for it? Yes, we have plans to disable "Internal mode", when most "External mode" problems will be fixed. So you are right, ticket is great idea.